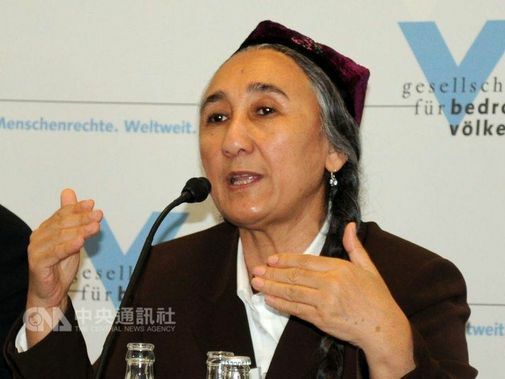 Taipei, Jan. 24 (CNA) A minor political party in Taiwan has invited World Uighur Congress President Rabiye Qadir to visit the island in March, plunging Taiwanese authorities into a quandary as to whether to issue a visa to her. Taiwan Solidarity Union (TSU), a pro-independence political party with no seats in the Legislature, said on Tuesday that Qadir accepted its invitation and hopes the Democratic Progressive Party government will grant her a visa. During a press conference, TSU played a video showing Qadir expressing her support for “all campaigns by Taiwanese to win true freedom” and soliciting support from Taiwanese for her campaign. “Taiwan, East Turkestan (Xinjiang), Tibet and South Mongolia (Inner Mongolia) share a common destiny; they must help each other, communicate with each other and exchange their experiences,” she was shown saying. TSU Chairman Liu Yi-teh (劉一德) said Qadir will exchange views with Taiwanese on human rights, self-determination and independence — topics he said all independence forces in Asia-Pacific could unite around. The Mainland Affairs Council, whose views on the matter will be taken into account before a final decision is made, said it will make a determination based on all prevailing external and internal factors as well as the principle of national interest. The Ministry of Foreign Affairs (MOFA) said the decision does not fall within its remit. “Qadir’s application for an entry visa will be dealt with by the relevant authorities based on existing laws,” MOFA said. Alex Huang (黃重諺), speaking for President Tsai, said Qadir’s visa application will be handled by “the responsible authorities” based on relevant rules and laws. He did not specify to which authorities he was referring, but the MAC is charged with mainland Chinese affairs, though the final say could lie with the National Security Council.